A big thank you to those who played along with the 200th Challenge at Sunday Stamps, we're happy to have the support! All the DT members picked a winner from the comments left on their blogs and my winner was Chris Smith. Chris, please email me at alcojo94@yahoo.com with your mailing address so I can get your prize out to you! 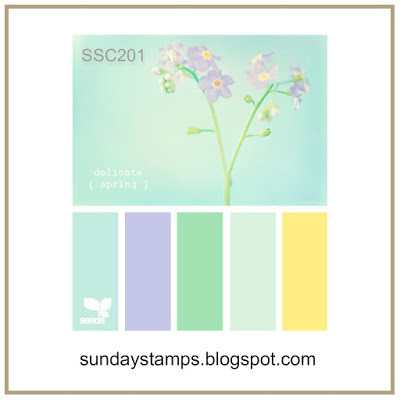 This week we have a color challenge and I instantly thought Easter when I saw the colors. I don't celebrate Easter but I like making cards for my friends that do! I used an image from the MFT Pure Innocence line for my card, creating a background with an MFT stencil and then popping up my image on the bottom of the card after coloring it with copics. I used the yellow, the greenish color in the middle and the light blue for my card. Make sure you visit the rest of the DT to see what they created and then play along with us, we'd love to see what you do with these colors! Another adorable card- send to me since you don't celebrate Easter! lol!